Mark Wilson says finding himself in the headlines over an alleged assault has impacted on his career and hopes it does not deter potential new employers. 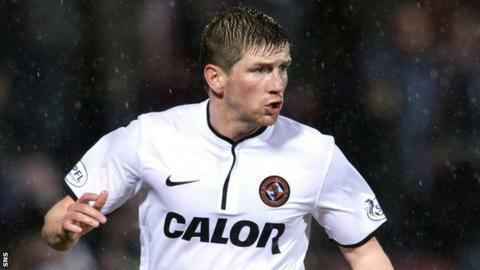 The full-back has left Dundee United three months after the incident involving Celtic's Lukasz Zaluska. Wilson says he had simply been helping the former United goalkeeper. "I just hope that anyone out there who is potentially looking to bring me in, or thinking I could do a job for them, would not hold it against me," he said. Wilson was not one of the men charged by police over the incident but was fined by United following an internal inquiry. "I was disciplined by the club and I hold my hands up and say I made an error going out that evening," the 30-year-old told BBC Scotland. "I had a reserve game the next day, which was optional, but I chose to play in it because I was hoping to show the manager my fitness and force myself into his plans. "But I had a long-standing arrangement with some friends and I did go out and I will hold my hands up - I had five beers in a seven-hour period. "That's my guilt and that's why I was disciplined." Wilson's contract was terminated by mutual consent after he failed to make any first-team appearances for United this season. He admits that injury problems at the start of the season were a major factor but believes that finding himself on newspaper front pages had also not helped. "It has had a massive impact," said Wilson. "I live quite a sheltered life for a footballer - never been in any bother and stayed out of trouble. "In terms of the case, I was there to help the player who was in trouble, which I did. "To then find myself plastered on the front pages of the paper, have reporters outside the house almost harassing my wife, it was a real eye-opener to see how the press works - a real intrusion and something that will stick with me for a long time. "It does knock your confidence and I remember standing outside the training ground in St Andrews and I was on the phone to my wife and a photographer was in my face taking photos. "It was so disappointing because I have always felt I had a good relationship with journalists. I have always tried to give them time." Wilson, who previously played for Celtic and Bristol City and has one Scotland cap, hopes the case does not hamper his search for a new club. "It was made out that I was part of the problem," he said of the newspaper stories. "You've got it hanging over your head. "I must admit that, if I saw a picture plastered on the front page of a newspaper, I would assume he was the guilty party. "But that night was blown massively out of proportion on my part. "And the people I've spoken to within football - coaches, senior players and former players - have been very supportive."